Not to sound like the guy who sold you pot in high school, but you ever think about hands? Hands are weird. Hand Simulator makes them even weirder. 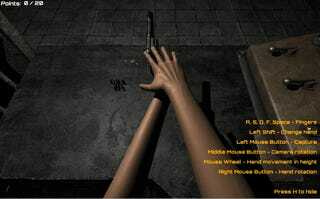 Hand Simulator is a game where you try to control virtual hands and do things like spin a fidget spinner or load and fire a gun. If this doesn’t sound hard to you, you’re wrong. I had a very long argument with managing editor Riley MacLeod about this, and in the end he admitted defeat. You control each finger with A, S, D, F, and the spacebar, rotate your hands by holding right click and moving the mouse, and grab things by clicking the left mouse button. You can only control one hand at a time, so you switch between them using left shift. It feels QWOP-like. The physics aren’t awesome, but that seems like a feature and not a bug. The hardest part of the game for me was having to consciously think about how I use my hands. When I tried, and failed, to pick up a bullet, I had to take the time to think about which fingers I would even use to do that. When it came to shooting, I only got as far as pulling the hammer back. I couldn’t even lift a fidget spinner off of the virtual office desk. (Editor’s note: I could! Take that! —RM) That said, these kinds of games are about failure, and I kept thinking about how fun it would be to stream something like this. While playing can be extremely frustrating, watching others struggle through Hand Simulator is hilarious. After I finished playing, two of my coworkers came up to give it a shot. Heather Alexandra managed to spin a fidget spinner, and then decided to just clear everything off the virtual desk. Don’t be surprised when all your favorite YouTubers and streamers give this game a try—it’s short, simple, and very watchable. Markiplier has done a video on it, and I found it pretty enjoyable. You might not want to play Hand Simulator if you’re easily frustrated, but you should definitely make your easily frustrated friend play while you watch.